This article appeared in the November 2018 issue of 48° North. 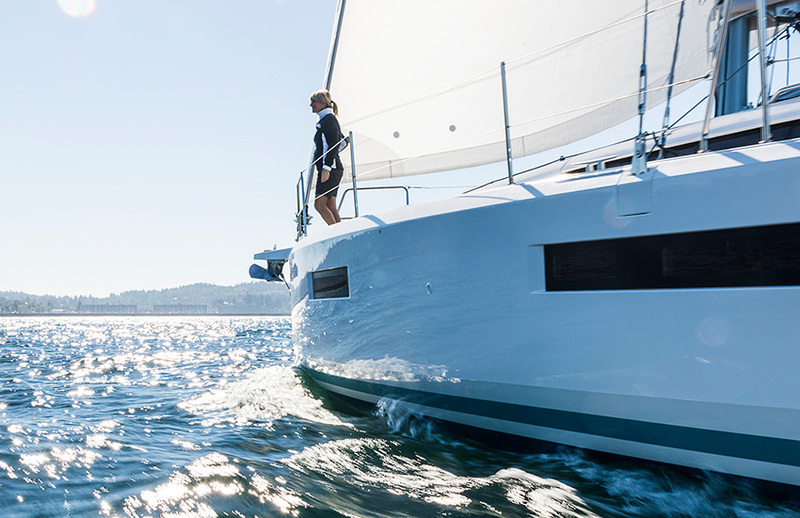 The new Jeanneau 440 is a seriously cool boat – innovative, confidence inspiring, and comfortable. The latest offering from the Sun Odyssey range, this Phillipe Briande design features several elements that are truly unique, and the experience of sailing the boat was surprising and impressive. Our test day brought us 12-17 knots of breeze and all the September sunshine any PNW sailor could hope for. It was one of my favorite sails of the year, and the boat itself had a lot to do with that sentiment. 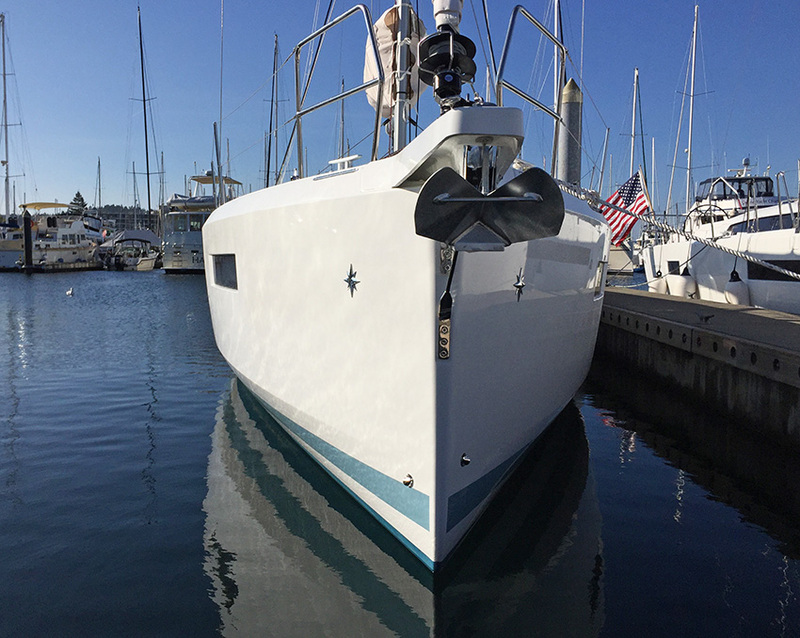 The most striking feature of the Jeanneau 440 was on display even at the dock. Jeanneau calls it “scow-bow” and it’s an innovation borrowed from ocean racing yacht design, first in the Mini-Transat class and now in many others. The clearly defined chines at the stern are pretty common these days, but the 440’s chine never stops and is carried all the way forward to the plumb bow – where it meets about eight inches above the knuckle. This fullness increases interior volume, and thus buoyancy, in the bow. Additionally, Jeanneau says the design improves performance. The trickle of technology and design from the high-end racing sector into the world of production cruisers appeals to me. Such advancements can catch a traditionalist off guard, but in this case, the application is so positive that it induces an about-face from the skeptics. Almost everyone I spoke to about the Jeanneau 440 raised an eyebrow at first; but anyone who had sailed it was a convert. I didn’t really need converting, but my expectation is that this design will influence many others in the coming years. The Jeanneau design team made another bold and innovative choice in the cockpit, aimed at rethinking the way that sailors move around the boat. The result is a clever solution to the transition from the cockpit to the side decks. On pretty much every other cruising boat I’ve ever been on, getting from cockpit to the side-deck involves a big step to a cockpit seat followed by another big step (or two) up and over the seat-back coaming. On the Jeanneau 440, the cockpit doesn’t use the full beam, because outboard of the cockpit on each side, the helm station sole transitions to a spacious side deck via a gentle ramp. This is a feature that I had heard about before I saw it, and I admit that I was skeptical about this part. After seeing and experiencing it in person, I find it elegant and intuitive. 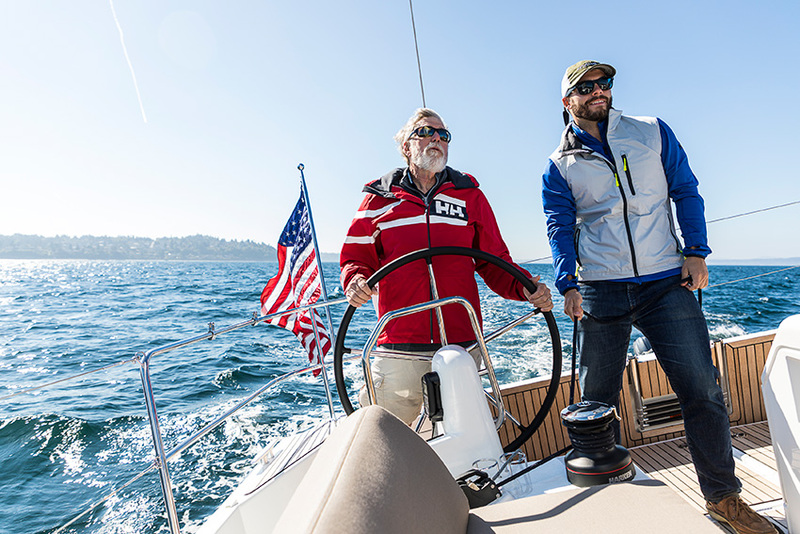 It provides a seamless pathway from the helm to the bow, and will be enormously helpful to sailors with mobility issues. The one thing we had to remind ourselves of was not to go the old way (over the cockpit seat and coaming) from the forward part of the cockpit unless you were ready for a big step down to ramp level. From the ramp to the bow, there’s ample side-deck room and clear passage through the split shrouds (one terminating inboard on the cabintop and the other outboard on the hull) which also provide a nice midship hand-hold. The helm station design itself, including the ramp, is pretty beautiful. Dual wheels drive the dual rudders. While the entire cockpit is inboard because of the side deck ramps, the helm station seats, located aft and outboard of the wheels, give a good view of the telltales. My favorite part of the helm station was the placement of the primary winches. For most of my sailing life, I’ve gotten used to bending over or kneeling on a cockpit seat to get to a winch. The more centered cockpit and narrower seat-back coaming requires a different placement of the winches, and Jeanneau has put them inboard and just forward of the helm. For shorthanded sailing on a cruising monohull, the ability to effectively access the winch from a standing position at the helm is quite new and really helpful. It almost goes without saying on a modern boat, but the main and jib sheets are led aft to each helm station. The optional dual chartplotters are permanently angled so a seated helmsperson could look down and get the full view of the screen, which is polarized to offset glare from sunlight. Since we’re getting into some of the trim settings and considerations, let’s talk about the experience of sailing this boat. In short, it was an absolute joy. We set sail on a close-hauled course. 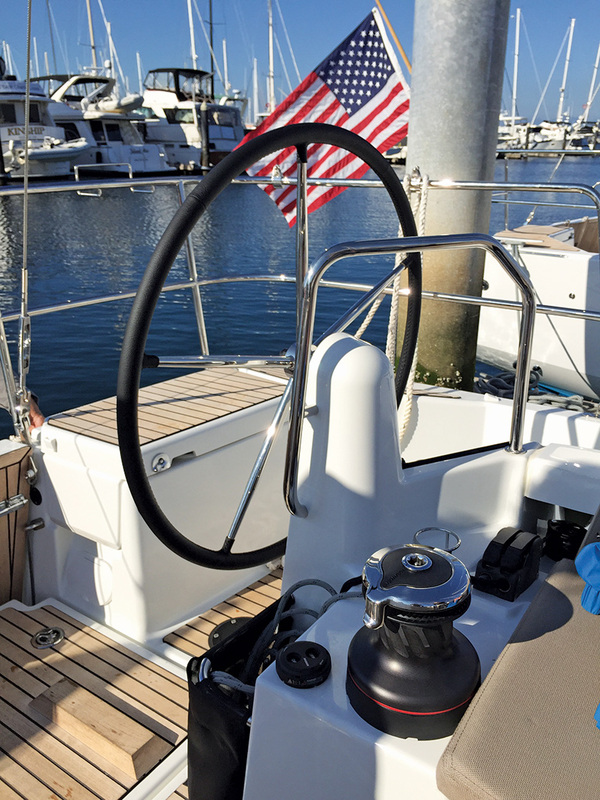 The 440 uses Jeanneau’s Spectra bridle system in lieu of a traveler, which doesn’t allow for much tweak-ability, but the traditionally rigged main (not in-mast furling, whoo-hoo!) trimmed into a nice shape even with simple controls. The standard 125% genoa was the perfect sail for the conditions and was easily adjusted. I appreciated this standard sail choice in a world where most new boats have self-tacking non-overlapping headsails that compromise performance for ease. Trimming and tacking was still easy thanks, in part, to electric winches. With very little effort towards set-up and trim, the boat was so balanced that I could let go of the helm for extended periods before a correction (15 seconds or more). Admittedly, the conditions were extremely cooperative, but the boat finds robust hullform stability when heeled on the chine, which puts the working rudder into a vertical orientation. The combination of stability and effective rudder angle make the boat feel very forgiving and confidence inspiring. We never overpowered the rudder. My compulsive sail adjustments didn’t feel like they were having a very big effect on the way the boat was sailing, and they were only making very small differences in boat speed. It felt like the boat almost sailed itself. The scow bow design under sail is remarkable. In 15 knot winds and moderate wind waves, the motion of the bow against the horizon kept catching my eye – like something didn’t compute. Since the bow design is so buoyant, the fore-and-aft pitching motion is significantly reduced; in essence, the boat doesn’t dig into the waves. Reducing that up-down pitching of the bow against the horizon seemed to reveal an eliptical side-to-side motion in the waves. It wasn’t a yaw – the boat wasn’t rolling and the heel stayed consistent – it was something new. The closest comparison is probably the view over the bow of a planing boat ripping downwind; but in that scenario, you’re going with (or over) the waves. I this case, the motion was short and quick because we were going to weather, but it was somewhat reminiscent of that bow-up almost surfy motion on a plane. The increased buoyancy also allowed the bow to stay up and dry. Typically, the further a boat heels, the more the bow digs in (on race boats, we move crew aft in heavy winds to combat this). While the Jeanneau 440 was solidly heeled in a fairly stiff breeze, it was a notably different sensation than I was accustomed to. The bow stayed up and the boat kept scooting forward. Additionally, the deck on the bow stayed remarkably dry. Avoiding big digs into the waves helped the boat retain its functional freeboard. We did a few tacks. The jib and mainsheet share the primary winches, but the “sharing” they must do was easy. Additionally, that great primary winch placement also brings the jib sheet clutches closer together (each within an arms reach if standing between the winches), making the process much easier if the same person is going to release the working sheet and bring it in on the new side. We eased the sails to bear away. Off-the-breeze, the boat felt good with the regular sail plan, but I would have loved to sail it under Code Zero or spinnaker off the stock bowsprit/anchor-roller. The Jeanneau 440 has a traditional backstay, which I appreciate particularly because the rig can have a smaller angle for the swept spreaders; which allows the main to go further out in downwind modes without pasting the sail against the rigging. The rig has only two spreaders and two primary shrouds, but gets additional stiffness from a “cathedral rig” system of spreader-to-mast diagonal shrouds, which also reduces weight aloft. A similar system is used on the TP52. The sail continued blissfully and easily. We made our way downwind reaching and running, and eagerly turned upwind again to feel the full effect of the scow bow once more. You wouldn’t necessarily think a 44’ cruising boat would be fun to sail, but it was. 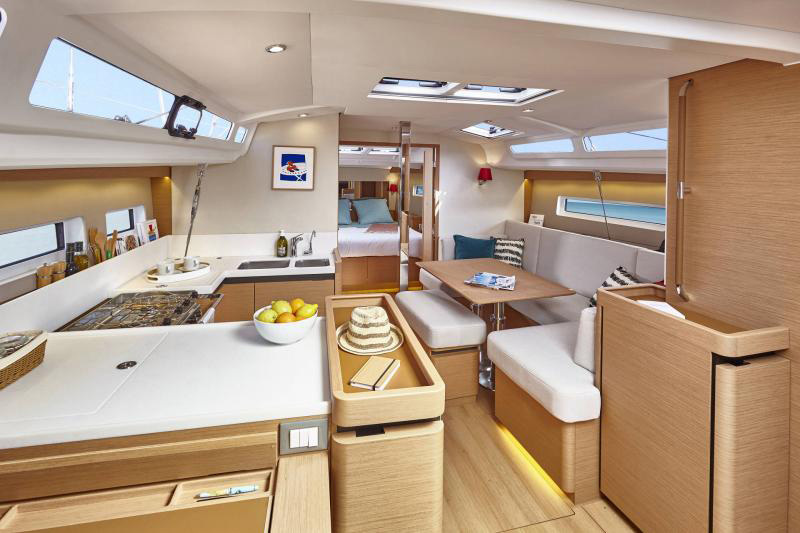 With 44’ of boat and extra volume athwartships thanks to the chines, the Jeanneau 440 has a lot of interior space. A few elements are particularly noteworthy. First, three massive hull portlights on each side make this one of the brightest monohull cabins you’ll find, and their locations bring light into both the salon and the cabins. Jeanneau has hidden most of the storage in the cabin, which lets your eye experience the full beam from hull to hull (there’s no cabinetry at eye level) and really opens up the space. There are many ingenius storage nooks, but it does make me wonder whether interior storage would feel limited for a passage. Lowering the storage in the boat and the midship-placement of the galley are aimed at keeping weight in the boat centered and low, which will aid sailing performance. The twin doors between the salon and V-berth (which features a full rectangular queen-size berth) make the cabin seem enormous; and are likely to stay open when cruising as a couple. The Jeanneau 440 is a bold, forward-thinking design. It’ll intrigue you at the dock, impress you on deck, and wow you under sail. Combine all that with luxurious cruising amenities – it really is the total package. Special thanks to Dan Krier and Marine Servicenter for taking us sailing. Joe Cline is the Editor of 48° North.